Le camping familial dans un verger à abricot et poire situé dans les collines au-dessus du Lac Skaha. 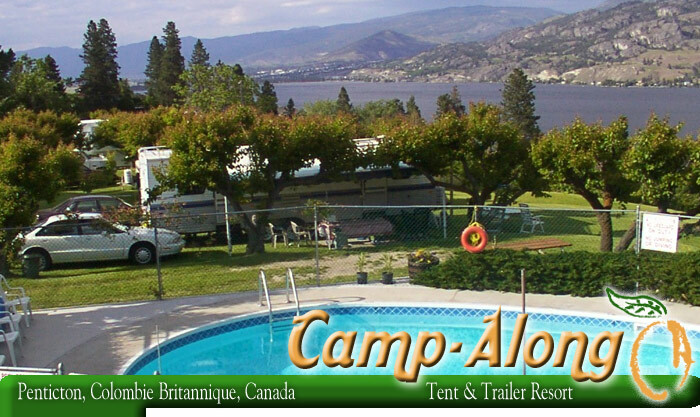 Camp-Along, located just minutes away from Penticton, is an excellent base from which to enjoy the area's many attractions. Located between Okanagan Lake and Skaha Lake, Penticton makes all water sports, including water and jet skiing, wind surfing, para-sailing, fishing, house-boating easily available or perhaps you would like to just relax on the miles of sandy beaches! Penticton's climate makes it possible to enjoy a long golfing season and campers will find several beautiful golf courses just a 10-minute drive from the campground. As a result of the growing winemaking industry, there are over 30 wineries to visit. Penticton also offers mountain biking and hiking trails, rock climbing on Skaha bluffs and skiing at Apex Mountain. Floating along the river channel is a unique activity. These and many more activities make the Okanagan an ideal vacation destination. Camp-Along is a special place nestled in the midst of all that the Okanagan has to offer. You see our campground wasn't created like most other parks where someone decides to build a campground, levels some field and pours concrete pads. Fruit farming has played and integral part in the history of the valley as well as of Camp-Along. Our park was originally a working apricot and pear orchard. Over 30 years ago, the owners decided to convert the orchard into a campground. Facilities were put in, sites divided and the old picker's cabins turned into an office. Camp-Along's come along way since then with improvements continually being made. The roads have all been paved, the washrooms are completely modern and clean, there's a heated pool plus countless other improvements. But the spirit hasn't changed. You'll still camp under those same apricot and pear trees. And if you find your self here when they're ripe, you'll even be able to eat the fruit right off the trees since they're organic.